Consider the impact a power disruption has on a patient in a hospital, a passenger on an airliner, or a scientist in a research laboratory. 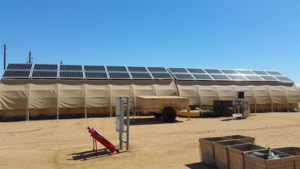 As institutions around the globe, from urban universities to remote military installations have become increasingly reliant on IT-based operations, so too have organizations realized the need for reliable, resilient sources of electricity. For these reasons, many organizations are increasingly turning to microgrids. 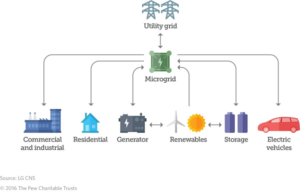 Microgrids allow smaller sections of the power grid – or areas of removed from the power grid altogether – to distribute and manage electricity even when there is a blackout or other disruption in the main grid. They can produce a high level of energy security, responsiveness, and resilience, and efficiency to organizations and local communities, while also providing the opportunity to reduce environmental impacts and long-term institutional costs. And utilities too are embracing them, as they can benefit the larger grid by avoiding major new investment expenses and increasing overall stability and reliability for their customers. Institutions such as airports, hospitals, military installations, universities, data collection centers, government agencies, and food distribution centers need auxiliary energy sources and storage during extreme weather and as a result of energy delivery disruption within the established utility grid. Remote communities across Canada’s northern provinces often rely on diesel and biofuel generated micro-grids for electricity. These scarcely populated areas are far removed from utility grid distribution of energy. As outlying communities, they are dependent on microgrids for secure, reliable, and resilient electric power. With the promise of alternative renewables these communities currently experience a high cost of energy generation and are ideal candidates for new connections to wind energy. Diesel fuel, while non-varying, also comes with a cost to humans in terms of expense, air quality, and fossil fuel emissions. The ability to strategically connect to battery-powered microgrid islands is a tool for allowing the lights to stay on and protecting property assets over longer term outages. As efforts to harness wind power and accompanying storage systems become successful, this abundant renewable resource will make it a candidate for application and installation in many other remote locals in North America. Panasonic Eco Solutions is partnering with the University of Ontario Institute of Technology on a microgrid project which will create a seamless source of power and enable Panasonic to use what they learned to offer a complete microgrid solution for future commercial projects. Houston, Texas experienced one of the most powerful storms when Hurricane Harvey descended on the Texas city and surrounding communities. Harvey costs over $125 billion (largely in flood damage), with over 30,000 people displaced and destruction of two thousand homes and businesses. Massive disruption of power followed, impacting rescue and recovery efforts. Personal losses were amplified by transportation, school and hospital closures. Microgrids, installed at several hospitals and a chain of 21 grocery stores, allowed these locations to serve as recovery centers. First responders and National Guard troops were able to use these stores as central communication centers with communication capabilities and coordinated rescue operations. Ameresco, a supplier of microgrid installations, has also observed a rise in applications among manufacturing firms. Microgrids allow these organizations to produce and distribute products with more attention to sustainable practices including reducing carbon emissions and saving on energy and water use. Second, solar-powered microgrids enhance sustainability as there are no greenhouse gases emissions when using the sun as a source of energy. Third, and one not fully utilized as of yet, the microgrid can be a source of backup power during shortages. Bloomberg New Energy Finance (NEF) estimates that hundreds of billions of dollars will be spent on solar and wind by 2050. Approximately 10 percent will be invested in lithium-ion batteries for microgrid storage and for electric vehicles. Bloomberg NEF projects several nations to be leaders for decarbonizing energy, including both Japan and Australia. Japan’s increased adoption of renewables will take place as energy demand declines along with increase decentralization of electricity as more consumers install solar photovoltaic on homes. Furthermore, Bloomberg NEF projects a continued decline in lithium-ion battery prices, which have already declined by 80 percent. There is a growing demand for local energy sources particularly in developing counties where it is estimated that 1.3 billion have no electrical energy access. In many of these countries, the construction of microgrids is being addressed in stages through generating, storage, and distribution systems. Access to electric power for lighting and cooking is a basic need for developing regions throughout the world. Microgrid technology, including renewable sources and combined with battery storage, can drastically improve the lives of the most vulnerable people in developing nations. A 2017 report from the Environment America Research and Policy Center entitled “Renewable Energy 100: The Course to a Carbon-Free Campus” highlighted the how colleges and universities are leading the way to a more sustainable future. The report cites 587 solar energy installations at 330 campuses in 41 states, and a growing number of universities which have committed to shifting to 100 percent renewable energy. The Environment America Research and Policy Center has established a number of tools to put colleges and universities on a pathway on the pathway to a clean, sustainable future. These include fact sheets and examples of on-campus solar, wind and geothermal energy, energy conservation and the pivotal role of microgrids and energy storage. Locally, Boston College and neighboring institutions Babson College and Wellesley College are exploring a number of energy and storage solutions to enable them to adapt proactively to the external challenges that lie ahead. 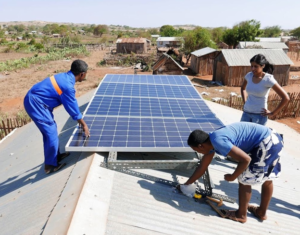 A Washington, DC based startup, oversees a solar array with a battery backup system installation on a school house in southeastern Madagascar. The modest addition, which allows school children to read after dark and villagers the opportunity to charge cell phones and solar lanterns, opens another pathway for microgrid technology to enhance and connect remote villages to the possibilities of modern life. Phil Jutras a member of the executive committee at BCEEAN and currently a visiting professor of management at Framingham State University. He is a graduate of the Carroll School of Management at BC and completed his graduate work at Boston University and BC. He served as chair of management and director of the MS program in Leadership at Regis College. He was a visiting scholar at MIT’s Learning Organization Society and is a member of the Energy and Co-Climate groups at MIT. Phil was the founder and director of the Green Enterprise Training Institute and serves on a number of sustainability non-profits.